We have developed a simple, reliable, and relatively inexpensive method for endotracheal intubation in mice via direct laryngoscopy using an otoscope with a 2.0 mm speculum. This technique is atraumatic and can be used for repeated measurements in chronic experiments. We find it superior to tracheostomy or previously reported nonsurgical techniques. Thomas, J. L., Dumouchel, J., Li, J., Magat, J., Balitzer, D., Bigby, T. D. Endotracheal Intubation in Mice via Direct Laryngoscopy Using an Otoscope. J. Vis. Exp. (86), e50269, doi:10.3791/50269 (2014). Mice, both wildtype and transgenic, are the principal mammalian model in biomedical research currently. Intubation and mechanical ventilation are necessary for whole animal experiments that require surgery under deep anesthesia or measurements of lung function. Tracheostomy has been the standard for intubating the airway in these mice to allow mechanical ventilation. Orotracheal intubation has been reported but has not been successfully used in many studies because of the substantial technical difficulty or a requirement for highly specialized and expensive equipment. Here we report a technique of direct laryngoscopy using an otoscope fitted with a 2.0 mm speculum and using a 20 G intravenous catheter as an endotracheal tube. We have used this technique extensively and reliably to intubate and conduct accurate assessments of lung function in mice. This technique has proven safe, with essentially no animal loss in experienced hands. Moreover, this technique can be used for repeated studies of mice in chronic models. The laboratory mouse has supplanted virtually all species as the principal mammalian model of biology and pathobiology. The laboratory mouse is the smallest mammalian species that has been clearly and extensively shown to be of value as a model of human disease and has proven invaluable in advances of our understanding of human biology and disease. The short gestation time and substantially lower cost has allowed the development and study of null and transgenic mice as a commonplace tool in biomedical research. However, the size of the average laboratory mouse (20-25 g) has limited their study in physiologically or surgically based studies and, consequently, some investigators study larger mammalian species. An impediment to using mice in these studies is the difficulty encountered with intubation techniques that would allow physiological measurements or extensive surgical procedures under deep anesthesia. Tracheostomy 1 has been used as a standard technique instead of intubation because of the greater ease of performing this technique and modest skill required. However, tracheostomy is not conducive to chronic or recovery surgery studies; thus, it is limited to acute experiments. Tracheostomy can also be a confounding variable in research in which inflammation or sensitive physiologic reflexes are important. Our laboratory has tried most of the techniques described by other investigators and found them inadequate for a variety of reasons. Tracheostomy is too traumatic and induces bleeding and airway inflammation. Much more problematic is that it cannot be feasibly repeated. Many relatively noninvasive techniques that require a modest investment in equipment are not sufficiently reliable. Other techniques require expensive equipment that is difficult to justify without knowing if the equipment will work in a specific application. Thus, we sought to develop a nontraumatic technique that required no more than a modest investment in specialized equipment, could be accomplished quickly and reliably, could be repeated in chronic models, and could be used in large numbers of animals. Here we report such a technique. Obtain mice that are older than 8 weeks and more than 20 g (smaller mice can be intubated by an expert). Induce anesthesia in mice with 3.5% isoflurane/oxygen in an induction chamber for 90-120 sec. Observe the respiratory rate carefully. It should slow progressively to not less than 45 bpm. Remove the mouse from the induction chamber and scruff tightly. Use cushioned fine forceps to gently extend the tongue from the mouth. Maintain extension of the tongue by holding the tongue between two fingers and applying gentle force. Pull the mouse up on the speculum of the otoscope with a vertical motion. Look through the ocular of the otoscope while scruffing tightly and pull the mouse up gently by the tongue and the scruff. Look carefully for the vocal cords. They should be easily visible at this time. The laryngis aditus (the structure of the laryngeal opening) should look relatively white. There should be movement of the cords with each breath. If the cords are not moving or are poorly visualized, rotate the animal slightly and gently hyperextend the neck. With the dominant hand, hold the 20 G, 1 in catheter, with a 1 cm length of the PE10 tubing extending through the tip of the catheter, like a pencil and insert it into the side of the speculum. The PE tubing serves as a stylet or bougie. Direct the PE10 tubing (stylet) through the vocal cords and advance the 20 G catheter (endotracheal tube) over the PE tubing until the hub is at the level of the lower incisor. Remove this stylet quickly. Gently take the animal off of the speculum and verify the tube location by placing the animal on a mechanical ventilator with continuous 2% isoflurane to maintain general anesthesia throughout the experiment. Visualize expired air (bubbles) going through a PEEP trap to confirm intubation. Although esophageal intubation may result in a few bubbles, it will not be as pronounced or as consistent with endotracheal intubation. Also, observe an airway pressure tracing for negative deflections (Figure 1). These confirm proper placement of the tube. Alternatively, place a small amount of water into IV tubing and connect it to the ET tube. Verifying movement to and from the mouse with respiration2. In the case of esophageal intubation, the pressure tracing will reveal significantly higher pressures and no negative deflections. Although end-tidal CO2 would be helpful, technically this would be very difficult given the small tidal volumes (~200 µl) and the equipment to do this would be very expensive. The simple techniques described are fully sufficient and much less expensive. If isoflurane anesthesia is not available, all procedures can be conducted using ketamine 80-120 mg/kg in conjunction with xylazine 10-20 mg/kg for general anesthesia. 3. Alternative Technique: Direct Laryngoscopy with the Otoscope Technique is Used Readily for Other Purposes, Mainly for Direct Instillation of Study Substances into the Lung. Induce anesthesia in the animals with isoflurane alone for this procedure at 3.5% for 90-120 sec in the induction chamber. Scruff the animal tightly at the base of the skull and extend the tongue gently with fine forceps. Holding the tongue gently, pull the animal straight up on the speculum (unmodified) until the animal cannot be pulled up further. The vocal cords can be visualized most often by this technique alone, but rotate the animal and hyper-extended the neck to bring them into full view. Advance a gel-loading pipette containing the instillate to the glottis and instill the fluid. Because the speculum makes a seal with the hypopharynx the mouse will aspirate any residual liquid that does not go through the cords. This is easily verified by the rhonchorous sounds the mouse now makes when breathing until the fluid is distributed fully in the lungs. Alternatively, connect PE10 tubing to a 0.5 ml syringe containing 50 µl of fluid with an air bolus behind the liquid. Advance the PE tubing carefully through the vocal cords for 0.5 cm and discharge the contents into the airway slowly. However, occasional trauma to the lower airway occurs using this technique without better delivery of the sample. Intubation with the above technique is reliable and fast. The appropriate placement of the endotracheal tube is most easily verified by observing expired gas bubbling from the submerged expiratory limb of the of the ventilator circuit (usually in a PEEP trap) and negative deflections on an airway pressure tracing (Figure 1). The negative deflections on airway pressure tracing are the most reliable. Others have used movement of a small fluid droplet in intravenous tubing connected to the expiratory ventilator circuit2. Although we have not used this technique extensively, it should be sufficient to verify tube location. An experienced operator can intubate mice using this method about 90% of the time on the first pass. For those that fail, the tube is immediately removed, the animal is reinduced with isoflurane anesthesia, and the placement again attempted. If the animal is left connected to the ventilator circuit in the case of an esophageal intubation, the stomach will gradually insufflate generating high peak airway pressures, hypoxemia, and ultimately death if there is no intervention. If high peak airway pressures are observed without negative inspiratory efforts, the animal must be promptly removed from the ventilator and extubated. However, removing the animal from the ventilator and removing the endotracheal tube easily reverse this. During the last 300 animal studies requiring intubation an experienced operator intubated 80% with the initial attempt and more than 95% by the second attempt. All animals were intubated by the third attempt of experienced operators. The time taken to intubate mice is up to 5 min for the preanesthetic, 90-120 sec to induce the mouse with isoflurane, and 30 sec to identify and actually intubate the airway. We have found that new trainees should learn to visualize the vocal cords first. If they can successfully demonstrate a full view of the vocal cords ten times, they are ready to begin training to intubate. Once trainees have successfully intubated 10 times, as demonstrated by negative deflections on an airway pressure tracing in a spontaneously breathing animal, they are ready to perform studies in experimental animals. However, a training video will greatly accelerate the learning curve. Only inexperienced operators induce airway trauma by this technique and deaths of animals may occur in this setting while learning the technique. However, loss of animals with an experienced operator is rare. This is our experience in more than 1,000 animals over the last 4 years. A 20 G catheter is used as an endotracheal tube in mice because it makes a tight seal with the airway, thus allowing accurate measures of airway pressures and it is of sufficient diameter for measures of airway resistance. However, using the PE tubing as a stylet or bougie allows the 20 G to pass easily and more reliably through the vocal cords. The 1 in (2.5 cm) length of the catheter allows the tube to be placed with the hub at the lower incisors for stability, but without causing trauma to the lower airway or intubating the mainstem bronchi. We use this technique to make measurements of airway resistance, perform methacholine dose-response curves (Figure 2), and to measure pressure-volume relationships in the lung (Figure 3). For all of these measurements the animals must be fully paralyzed to obtain useable, accurate data. For this purpose we have used pancuronium bromide as an inexpensive, nondepolarizing paralytic in nonrecovery experiments. However, pancuronium is no longer available and cannot be used on animals that are going to recover because of its long half-life. Therefore, we have switched to vecuronium (30 min) or rocuronium for paralysis because of their shorter half-life, providing the option of repeated measurements over time. Other investigators have used succinylcholine as a depolarizing paralytic, but its half-life has been too short for the majority of our experiments. Also succinylcholine can cause histamine release3 and would therefore be a potential confounding variable. We have also used the direct laryngoscopy technique extensively for the delivery of test substances to the lung based on a technique originally reported in rats by Hastings4. Most investigations have used nasal instillation for the delivery of test substances to the lower respiratory tract because mice are obligate nasal breathers and nasal instillation is easy. However, we have found the nasal instillation method to be unreliable for quantitative delivery. By using the direct laryngoscopy technique we have found that quantitative delivery is more reliable and distribution in the lung is more uniform. Our principal use of the direct instillation technique has been to deliver antigen to the lower respiratory tract in a model of allergic inflammation (Figure 4) and airway hyperresponsiveness (Figure 2). We have also delivered other test substances such as cytokines and drugs via this method. Figure 1. Airway pressure tracing. The blue line reflects the airway pressure and the red line reflects the tidal volume tracing in the mouse immediately after intubation. The negative (downward) deflections of the pressure curve (black arrows) indicate the generation of negative intrathoracic pressure in the mouse (C57BL/6, 24 g) by spontaneous respiratory effort and indicates proper placement of the endotracheal tube. Please click here to view a larger version of this figure. Figure 2. Airway resistance and methacholine dose-response curves. Mice (C57BL/6) intubated by this technique can undergo measures of airway resistance and bronchial reactivity using doubling doses of methacholine delivered via ultrasonic nebulizer. 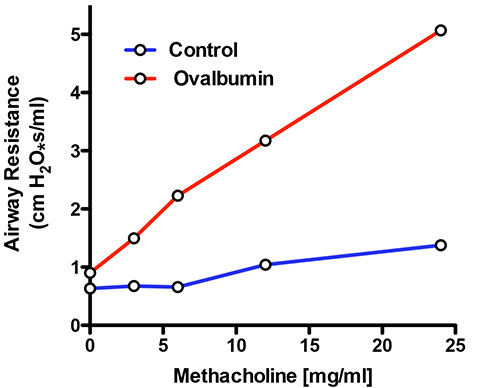 In this representative example, a control animal has a minimal response to methacholine up to 25 mg/ml and ovalbumin immunized and challenged mouse demonstrates hyperresponsiveness to methacholine. These measurements are made with mice intubated with a 20 G catheter and are indistinguishable from those made in a tracheostomized mouse. Figure 3. 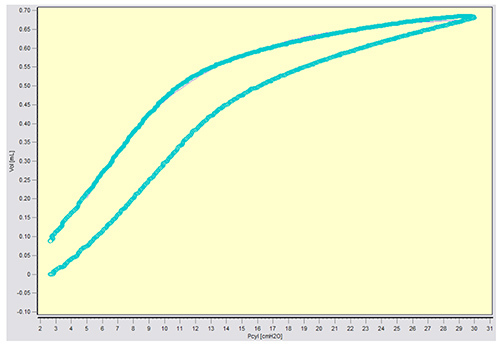 Pressure-volume curve. This is a representative pressure-volume curve in a 20 g mouse that has been intubated with a 20 G intravenous catheter, paralyzed with pancuronium, and is mechanically ventilated. It demonstrates that the catheter does not leak up to 30 cm H2O pressure and can therefore be used to make accurate measurements pressure-volume relationships in the mouse. Figure 4. Ovalbumin model of allergic inflammation. 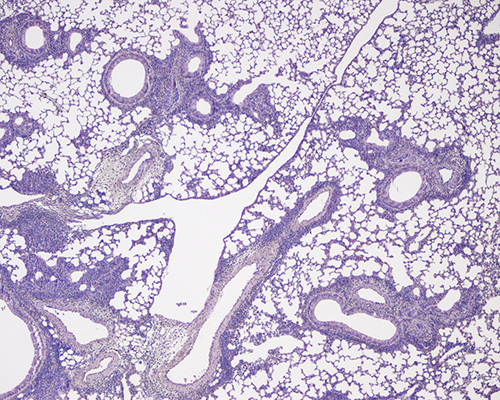 This is a representative hematoxylin and eosin stained section of mouse lung that has been immunized and challenged with ovalbumin. It demonstrates the generalized effect of instillation of ovalbumin administered via the direct laryngoscopy method (magnification 4X). In this report we describe a simple, reliable technique to intubate mice that is nontraumatic and can be used repeatedly in the same animal. This technique can be accomplished with simple laboratory or medical equipment that can be purchased for a modest sum. The technique of direct laryngoscopy, originally reported by Hastings and colleagues4, can also be used for a variety of purposes, but mainly to accurately deliver test substances to the lower respiratory tract. We have found this technique superior to those reported by other investigators to date because of its ease, speed, simplicity, reliability, low expense, and potential for repeated measures. Techniques to intubate mice are not new. One of the earliest reports, used transillumination of trachea followed by oral intubation with a 24 G catheter5. However, this study and others6,7 did not provide sufficient information to replicate the technique in our laboratory. Recently other investigators have used this transillumination technique with greater success8,9. The first detailed study by Brown and colleagues reported a study in which mice, suspended on a 45° backboard, had their tracheas transilluminated and their trachea intubated orally with PE90 tubing under direct visualization using a fabricated laryngoscope blade10. This technique has proven difficult to replicate and, therefore, has not been utilized extensively. Additional reports describe the use of rigid optical scopes or fiberoptics to enhance the reliability of the techniques. Vergari and colleagues11,12 used a rigid arthroscope 1.7 mm in outer diameter to visualize the vocal cords and then placed a guide wire through the glottis. The authors report 100% success with this technique that they performed with specialized and expensive equipment. The cost of this surgical equipment seems prohibitive for widespread use in mice. Additional techniques have been developed using an operating microscope and a 2f guide wire13. This technique is similar to ours, but requires the use of an operating microscope, and thus we favor the use of an otoscope that is substantially less expensive. Fiberoptic intubation techniques have also been reported using a relatively inexpensive battery powered fiberoptic source14. We have attempted to use this fiberoptic technique, but have found the light less than useful because there is no corresponding fiberoptic visualization channel. MacDonald and colleagues used a more powerful halogen light source and reported success in a small sample. They were able to repeatedly measure airway resistance15 also. Repeated measures of airway resistance at different time points has been reported by others16. Zhao, et al. used a retrograde technique by puncturing the trachea and feeding a guide wire through the hypo- and oropharynx17. More recently Singer, et al. have performed selective intubation of the left mainstem bronchus in the mouse using an operating microscope and fluoroscopy to document the location of the catheter18. They then used this method to instill test substances selectively into the lung. However, this again would not be a method that could be used without significant expense and highly technical training. Moreover, fluoroscopy would also add a radiation hazard to the study. In summary, direct laryngoscopy of mice using a pediatric otoscope is a valuable technique for intubation, repeated intubation and test substance delivery without intubation. We find this technique superior to tracheostomy and previously reported methods of noninvasively performing endotracheal intubation in mice. A Merit Grant from the Department of Veteran Affairs and a T32-HL098062 grant from the NHLBI of the National Institutes of Health supported this work. We wish to gratefully acknowledge the advice of Randolph H. Hasting, M.D., Ph.D. and the advice and support of the Veterinary Medical Unit of the VA San Diego Healthcare System. Rockman, H. A., et al. Segregation of atrial-specific and inducible expression of an atrial natriuretic factor transgene in an in vivo murine model of cardiac hypertrophy. Proc. natl. Acad. Sci. U.S.A. 88, 8277-8281 (1991). Watanabe, A., Hashimoto, Y., Ochiai, E., Sato, A., Kamei, K. A simple method for confirming correct endotracheal intubation in mice. Lab. Anim. 43, 399-401 (2009). Orebaugh, S. L. Succinylcholine: adverse effects and alternatives in emergency medicine. Am. J. Emerg. Med. 17, 715-721 (1999). Hastings, R. H., Summers-Torres, D. Direct Laryngoscopy in Mice. Contemp. Lab. Anim. Sci. 38, 33-35 (1999). Berul, C. I., Aronovitz, M. J., Wang, P. J., Mendelsohn, M. E. In vivo cardiac electrophysiology studies in the mouse. Circulation. 94, 2641-2648 (1996). Ewart, S. L., Gavett, S. H., Margolick, J., Wills-Karp, M. Cyclosporin A attenuates genetic airway hyperresponsiveness in mice but not through inhibition of CD4+ or CD8+ T cells. Am. J. Respir. Cell Mol. Biol. 14, 627-634 (1996). Ewart, S. L., Mitzner, W., DiSilvestre, D. A., Meyers, D. A., Levitt, R. C. Airway hyperresponsiveness to acetylcholine: segregation analysis and evidence for linkage to murine chromosome 6. Am. J. Respir. Cell Mol. Biol. 14, 487-495 (1996). Spoelstra, E. N., et al. A novel and simple method for endotracheal intubation of mice. Lab. 41, 128-135 (2007). Boll, H., et al. High-speed single-breath-hold micro-computed tomography of thoracic and abdominal structures in mice using a simplified method for intubation. J. Comput. Assist. Tomogr. 34, 783-790 (2010). Brown, R. H., Walters, D. M., Greenberg, R. S., Mitzner, W. A method of endotracheal intubation and pulmonary functional assessment for repeated studies in mice. J. Appl. Physiol. 87, 2362-2365 (1999). Vergari, A., Polito, A., Musumeci, M., Palazzesi, S., Marano, G. Video-assisted orotracheal intubation in mice. Lab. Anim. 37, 204-206 (2003). Vergari, A., et al. A new method of orotracheal intubation in mice. Eur. Rev. Med. Pharmacol. Sci. 8, 103-106 (2004). Hamacher, J., et al. Microscopic wire guide-based orotracheal mouse intubation: description, evaluation and comparison with transillumination. Lab. Anim. 42, 222-230 (2008). Rivera, B., Miller, S., Brown, E., Price, R. A novel method for endotracheal intubation of mice and rats used in imaging studies. Cont. Top. Lab. Anim. Sci. 44, 52-55 (2005). MacDonald, K. D., Chang, H. Y., Mitzner, W. An improved simple method of mouse lung intubation. J. Appl. Physiol. 106, 984-987 (2009). De Vleeschauwer, S. pI., et al. Repeated invasive lung function measurements in intubated mice: an approach for longitudinal lung research. Lab. Anim. 45, 81-89 (2011). Zhao, X., et al. A technique for retrograde intubation in mice. Lab. Anim. 35, 39-42 (2006). Singer, T., et al. Left-sided mouse intubation: description and evaluation. Exp. Lung Res. 36, 25-30 (2010).